In Program Options, choose to use Time Spent or Sessions or neither field. The Time Spent field is enabled by default. In Attendance, you can use the Time Spent data to keep track of how many hours you are schooling per day. When you set up a Course, you can choose to have the credit hours awarded based on the student meeting a minimum amount of Time Spent or Sessions, or you can set it up to award partial credit depending on Time Spent or Sessions completed by the end of the school year. In the Home/Away Report, Time Spent will show how many hours of schooling occured in each location, broken down by Subject/Course. And the Time Spent/Sessions Report will show the number of hours spent in each Subject/Course for a selected Student and Date Range. The Time Spent field is optional and can be enabled and disabled via Program Options in the HSTOnline menu. By default, the Time Spent field is enabled. Disable the Recalculate Time Spent option under the Action button in the Agenda - List View. 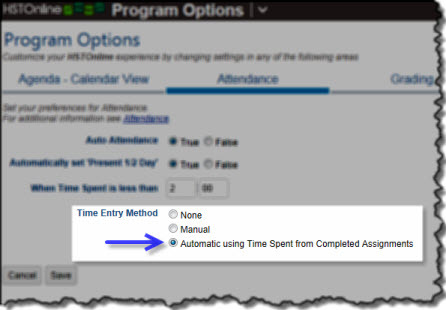 Click or touch the radio button for Time Spent to enable the field; click or touch a different option (None or Sessions) to disable the Time Spent field. When the Time Spent field is enabled, you can choose whether to display or hide the column in the Agenda - List View and/or Lesson Plan pages. 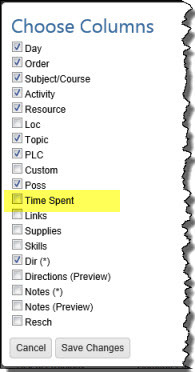 Click or touch the checkbox next to Time Spent to add a checkmark to display the column; or to remove a checkmark to hide the column. Time Spent is entered as hours and minutes (HH:MM) and can be added to Assignments and Lesson Plan items. You can enter your Time Spent for each item individually, or use the multi-edit feature to enter the same Time Spent for two or more items at the same time. Please see the associated Help Pages for step by step instructions. If you are using Start/End times to schedule your Assignments, you can have HSTOnline automatically fill in the Time Spent field based on the starting and ending time of each Assignment. So if your Start Time is 8:00am and your End Time is 8:45am, HSTOnline will enter 0:45 in the Time Spent field. The Time Spent field must be enabled. For the Organization option, click or touch the radio button for Start/End Times. 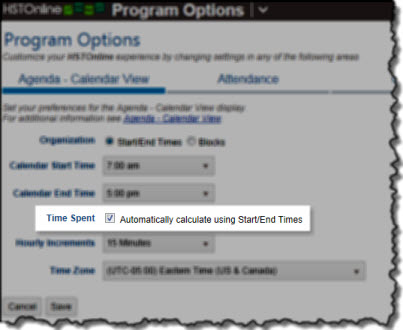 Check the box next to Time Spent to have HSTOnline automatically enter a Time Spent value based on the Start and End times entered for each Assignment. You can edit the automated entry at any time. HSTOnline will only overwrite your changes if you alter the Start Time or End Time for that assignment, or if you use the Recalculate Time Spent tool. If you choose to keep Attendance records, you can also have HSTOnline display the total Time Spent for all completed Assignments on that date next to the Present or Present 1/2 Day notation. This option is set in the Time Entry section of the Attendance Options. HSTOnline can perform this task whether you are entering Attendance manually or using the Auto-Attendance feature. If you are manually creating Attendance records, the Time Spent value will be entered when you save the new Attendance entry. Time Spent will be displayed in the HH:MM format in parentheses following the Present or Present 1/2 Day notation. You do not have to use Start/End times nor the Auto-Calculate Time Spent features utilize Time Spent in your Attendance records. For Time Entry Method, click or touch the radio button for 'Automatic using Time Spent from Completed Assignments'. Use the Recalculate Time Spent option at any time to have HSTOnline audit your Assignments within a selected date range to update the Time Spent fields based on the Start/End times. The Time Spent value will be zero (0) for Assignments where the Start/End time fields are blank. This menu option is only available when the Time Spent field is enabled and Start/End Times are in use. On the HSTOnline menu, click or touch the Agenda - List View link. Click or touch the Action button and choose Recalculate Time Spent. Students: Choose the Students whose records you want to audit. While this option starts with no Students selected, on subsequent returns, HSTOnline will remember your previous selections, which you can change as needed. Date Range: Enter a Start Date and End date by typing into the fields using the mm/dd/yyyy format, or use the calendar icons to select a date for each field. Cancel to abandon the recalculate process. Go to proceed with the process. HSTOnline will audit all Assignments within the date range, regardless of completion status, and adjust the Time Spent field to reflect the current start/end times for each of those Assignments. For those Assignments where the Start/End fields are blank, the Time Spent field will be set to zero.